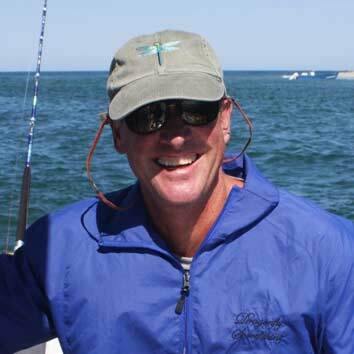 Most High Season Dragonfly Sportfishing charters will depart from The Town Landing at River Road in Orleans, Massachusetts. “River Road” is a town-owned facility with a large, stable dock and a very nice launch ramp. Take exit 12, turn right off the exit onto Cranberry Highway (Route 6A) At the traffic light, turn right onto Eldridge Parkway. Proceed straight through the 2nd traffic light (at the Orleans Firebirds Baseball Field). At the next traffic light, turn right onto Main Street (Beach Road). Go 3/10 of a mile and bear right on River Road. Proceed straight through the stop sign and down to the end of River Road. The dock is straight ahead on the left side of the parking lot, and the Dragonfly will be waiting at the end of the dock for you. Parking at the very end of River Road is restricted to residents only from June 15th thru Sept 15th. We suggest that you pull down to the bottom of the hill by the dock and unload all of your passengers and supplies. One person can then take the car back up the hill and Park on the right-hand side of River Road (east side) between Lucy’s Lane (130 yards) and Linden Lane/Packet Landing (230 yards) see Google Earth photo. If there are no parking spaces available just call Captain Mike on his cell phone at 774-212-0712 and he will come pick you up at the off-site parking that is readily available. Follow Route 6 west to the Orleans rotary. Take the third exit off the rotary on Route 6A (Cranberry Highway) toward Orleans. Proceed straight through the traffic light at the Stop & Shop to the next rotary and take the third exit, staying on Route 28 toward Chatham. Go to the next traffic light and turn left on Main Street. Go 3/10 of a mile and bear right on River Road. Proceed straight through the stop sign and down to the end of River Road. The dock is straight ahead on the left side of the parking lot, and the Dragonfly will be waiting at the end of the dock for you. 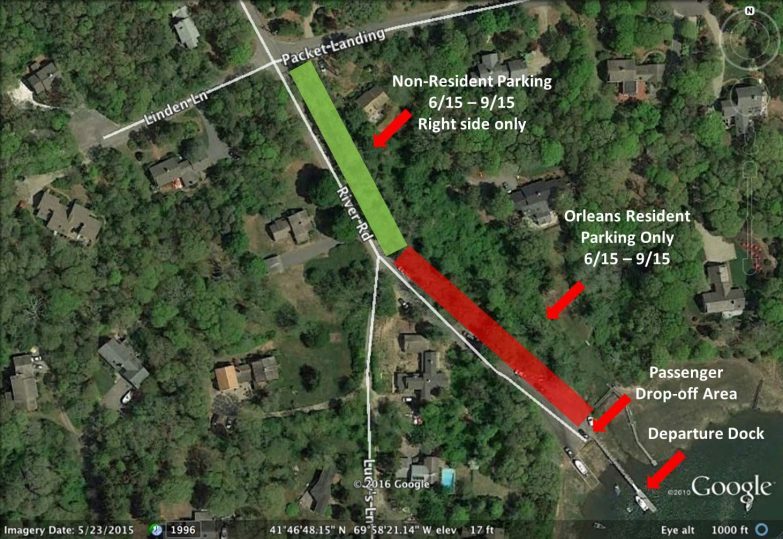 Parking at the very end of River Road is restricted to residents only from June 15th thru Sept 15th. We suggest that you pull down to the bottom of the hill by the dock and unload all of your passengers and supplies. One person can then take the car back up the hill and Park on the right-hand side of River Road (east side) between Lucy’s Lane (130 yards) and Linden Lane/Packet Landing (230 yards) see Google Earth photo. If there are no parking spaces available just call Captain Mike on his cell phone at 774-212-0712 and he will come pick you up at the off-site parking that is readily available. We apologize for this seasonal inconvenience!